(NaturalNews) Ever since the 1940s, our trust and focus have been solely driven towards penicillin and the use of antibiotics, as these became widely employed by medical practitioners in the treatment of disease. For some reason, natural remedies weren't good enough anymore. They kept us alive for the better part of our history, but now it was time for man-made chemicals to take over. As it turns out, we made an incredible mistake when we pushed natural medicine aside. Here's another reason why! What tastes great, smells awful and should be avoided at all costs before kissing someone? Garlic! For centuries, this plant was employed as a natural antibiotic. 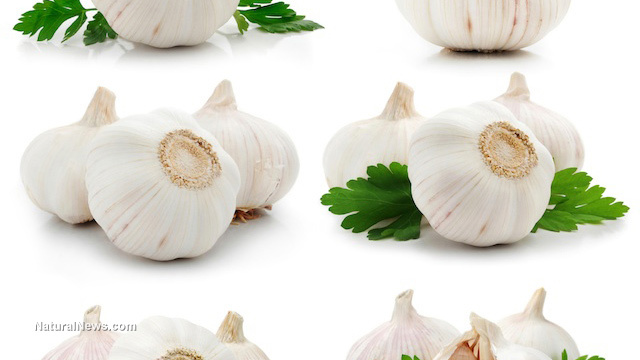 Until now, modern medicine has kept its distance from it, but recent studies have found that a compound inherent to garlic, Diallyl disulfide, is actually 100 times more effective against bacteria than antibiotics such as erythromycin and ciprofloxacin. What's more, garlic is 1,000 times more potent at piercing the protective outer layer of bacteria than our artificially developed chemicals. Knowledge of natural medicine has been passed down from one generation to another from ancient times. Indeed, the Ancients had health tips, but no blogs to spread them with, so folklore and mythology became the best way to transmit the importance of certain herbal remedies – and one of those was garlic. This plant has its very own role in mankind's history. Even the Babylonians and Romans used it as a remedy. In more recent times, garlic became the go-to cure on the battlefield of the First World War. Not everybody could afford penicillin, so they used garlic instead. Soon enough, the plant's effectiveness and widespread use earned it the title of "Russian Penicillin." Of course, folklore is not always reliable. After all, there's no Loch Ness monster, and vampires don't turn into bats – but it all starts from a grain of truth. Using this assumption, researchers dedicated more time to exploring the medicinal benefits of garlic. Experts from the Washington State University decided to give garlic a fair match-up against bacteria and see how it holds up. As it turns out, the smell doesn't only repel other people, but also diseases. Last year, two other papers were published by the same researchers from Washington State, wherein the scientists from the department of Applied and Environmental Microbiology and Analytical Chemistry found that garlic can also kill food-borne pathogens like Escherichia coli or the ones responsible for causing listeriosis. That's right, garlic is also a great natural disinfectant and preservative. So, the good news is that you can use garlic to fight off the accumulation of bacteria in your body, as well as to clean food surfaces or preserve your food. More importantly, the compounds that make garlic what it is can easily be derived without the use or introduction of harmful chemicals. For the organic food industry, this is an incredible step forward, as it will provide manufacturers with new, harmless ways of maintaining the freshness of their products. Studies have also proven that it can help fight off cancer. Nevertheless, you shouldn't stop here. Garlic is not the only natural remedy you can use in the fight against disease and illness. From various fruits and veggies, to spices and essential oils, there is a world of green remedies out there ready to provide your body with vital nutrients. Unlike prescription drugs, natural medicine doesn't come with incredibly harmful side-effects. At most, you'll get a stomach ache. So, all things considered, isn't the smell of garlic a small price to pay for great health?